Years ago I was looking to make some significant changes in my personal life, career and health, but I wasn’t sure how to go about beginning. I felt like the finishing line was so far away and I didn’t know how to get there. Then, one night at my monthly book club meeting my friend Allison shared with us that she was leaving her job (and Chicago) to start her own business, go to Graduate school and move across the country to Denver! WOW! I was surprised, shocked and excited, but I also had some questions. How did Alison figure all this out? How was she going to do it all? We made a date to have coffee later that week so she could show me her vision and action plan. I wanted whatever she was having! Allison explained her process and I was hooked! We started working right away. She had me begin by “visualizing my vision”. I listed the process (via WellCoaches.com) in depth below, but there’s no wrong way to brainstorm what you want your career, personal life and/or wellness to look like. This is Alison (right) and I (left) celebrating her birthday before her big move to Denver. Begin by taking a few deep breaths and focusing on your inhalations and exhalations. Picture yourself one to two years from now. What does your career, personal life, family, health, or wellness look like. How do you look physically? What are you wearing? How does your body move? Notice any other changes in your life. Describe what you are doing, feeling, and thinking. Imagine that it is five years from now, and you have accomplished your goals. What does it feel like. What are you doing differently? What is the same? What did you do to get there? Who’s around you? What activities are you doing? Describe your career, relationships, and health now. Who has helped you along the way? Think of one key word to summarize this experience and/or your commitment to your goals, visions, or wellness. Take 3-5 minutes to free-write your what came to your mind during your visualization. Visions are best written in the present tense, as if they are already happening and in your own voice. You don’t have to limit yourself to writing your vision; you can create a representation of your vision through art, collage, an acronym, poetry or any other method that speaks to you. 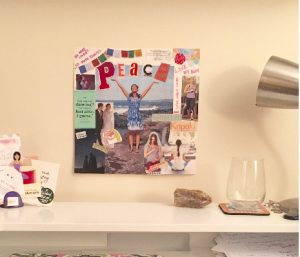 (I created a collage along with writing down my vision so I could have a daily reminder at my desk). Once I had created my one year vision we began to work backwards in 3-month increments. 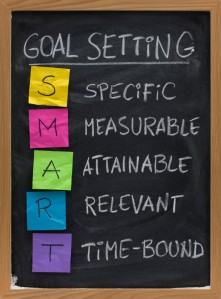 Looking at small, action steps (based on the SMART goal process below) I could take to reach my 3-month goals and ultimately live my greater vision. We created accountability with one another and scheduled quarterly coffee dates or phone calls where we could chat about our progress, brainstorm ideas for overcoming challenges, empathize about failures and celebrate successes. While my original timeline has come and gone, the process of creating a vision and setting small SMART goals and action steps has remained a part of my life as I continue to build a greater vision for my career, relationships and health and wellness. Visualize your vision. Write it down, draw it, paint, it, etc. Make it big, bold and all about YOU! Recruit an accountability partner, friend or consider working with a coach. Create 3-month goals, along with SMART action-steps to get you moving towards your vision. Schedule time once a month to review your monthly and 3-month goals and make any changes or additions. Check-in with your accountability partner at least once every 3-months or monthly, if possible. CELEBRATE! You are doing great and amazing things towards living your vision. Don’t discount the work you are doing because you haven’t gotten to your finish line. Take time monthly or quarterly to celebrate your accomplishments (small or big!). Be curious. Sometimes the best laid plans just don’t work out. Instead of seeing this as a failure, explore what didn’t work and why. Then experiment with a new method, SMART goal or action step. Be the scientist of your own life. You can even use these same strategies to work on challenging yoga poses or inversions. 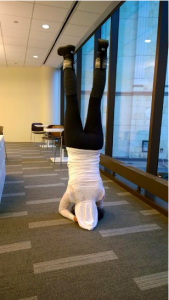 When I decided I wanted to learn forearm stand back in 2014 I created a 3-month plan and some SMART goals to help my get upside down! Measurable: I tracked my progress and number of days I practiced per week. Attainable: At the time I was already proficient 2 other arm balances, so I felt forearm stand was attainable. Time-Bound: 3 months seemed like a fair amount of time, but I was okay if it took longer. I committed to practicing (in any capacity) for 3 night per week. First, I researched forearm stand, methods, suggestions and the anatomy of the pose. I found a great tutorial online that gave you a clear plan for learning how to do forearm stand starting with your body near a wall, building core strength and then finally moving to the center of the room and getting some air time. It was super challenging at first. I fell into my dresser, the bed and the floor a few times, but I kept at it 3 nights a week until I felt stronger (and braver!) and was able to rock a pretty sweet forearm stand in the center of the room! This is what I know to be true; in life, and on your yoga mat, you can’t rush through the small steps to get to the finish line. You have to explore, experiment and create a strong foundation before you can stand tall, living your vision or on your forearms in the center of the room! I know that you need an accountability partner, friend or yoga teacher to bounce ideas off of, support you (mentally and physically) and celebrate each step towards you reaching your goals. I know that you will experience lapses, make wrong turns, wobble, falter and maybe even take a tumble or two. The strength lies in your unwavering commitment to your vision and belief that you can accomplish your goals no matter what. So, what does your vision look like? I’d love to hear what goals you have in mind for the next 6 months of 2016. Comment below with your vision, goals or if you have any forearm or handstand tips. Cheers!